We are now fully mobile with a mobile app offering on Andoid and Apple devices. Search for products or look up product details while away from your office — Saves you time! Don’t remember a part number you bought in the past? — No worries, just go to the My Purchases screen. My Purchases is a running list of all products your company has purchased from Würth Baer Supply Company in the last 12 months. Have multiple jobs with different specifications? — Create a shared Shopping List for each job and make it easier for yourself and all your co-workers to order for the different jobs. No time to call customer service to place an order — Simply click, add to your cart and submit. You can place an order that easily! 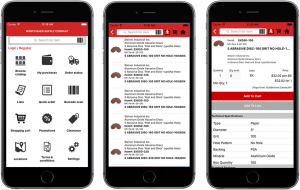 Search for Würth Baer Supply Mobile in the App Store or on Google Play. This entry was posted in Mobile App, Tools, Website and tagged app, mobile, mobile app, website. Bookmark the permalink.